This is one walk that won't leave you bored! The term "Boardwalk" comes from Alexander Boardman, a train conductor and innkeeper in Atlantic City, NJ who in the 1860's came up with the idea as a way to keep sand out of passenger rail cars and hotel rooms. This new wood-lined sidewalk was originally called "Boardman's Walk" and the name was later shortened. 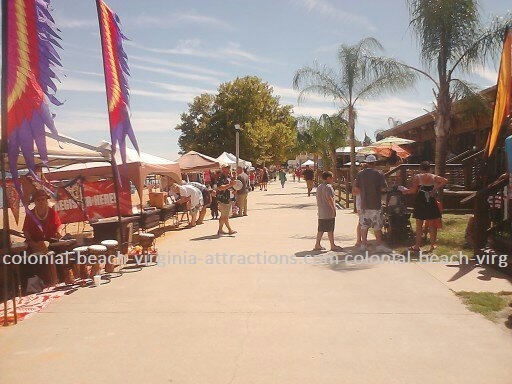 The Boardwalk in Colonial Beach today is quite different from back in the day when big steamer ships like the St. John's would bring weekend vacationers in from northern Virginia and Washington, D.C. Things have changed a lot since those days. Let's start "walking" our virtual tour of the Boardwalk at the former Days Inn motel. 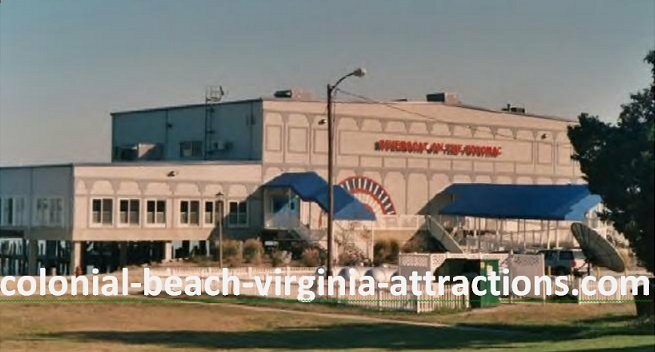 This was built on the site of the old Colonial Beach Hotel, which was dismantled in 1984. 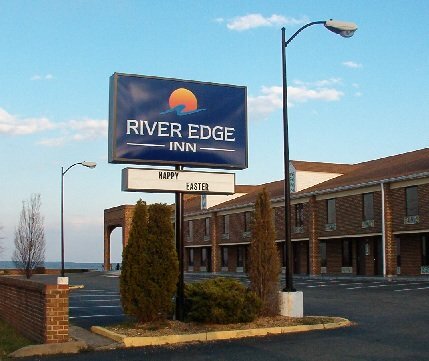 The Beach Inn (now River Edge Inn) has 60 rooms and a swimming pool. Just behind the hotel property is the area known as Town Commons and Town Hill. There's a stage here, a couple of outbuildings and a gazebo. 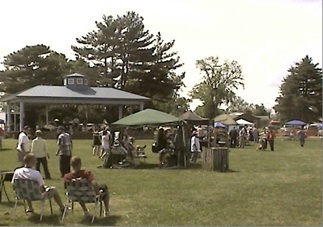 This area is used for a lot of the town's special functions and gatherings like the Boardwalk Arts & Crafts Festival, Potomac River Festival, the former Family Movie Night, Market Days & Bluemont Concerts, and more! On your left, you'll see the Riverboat on the Potomac. This property is actually located in Maryland. It's built out over the water and the state of Maryland oversees the Potomac River. The Riverboat hosts special functions like parties, weddings, and conferences. They have Texas Hold-Em poker tournaments, Keno, off-track betting, karaoke, comedy club shows, estate auctions and more. The building also houses a restaurant, a bar and a liquor store. The Riverboat was mangled by Hurricane Isabel in 2003, so the property was rebuilt and made much more sturdy and a lot bigger. 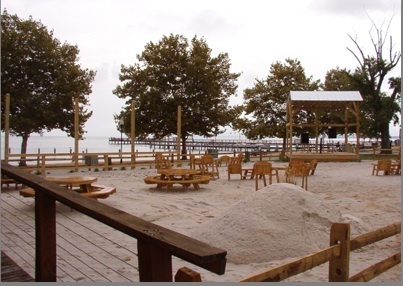 Just past the Riverboat you'll notice a sandy play area with a swingset for the kids. To your right, there once was a grassy area with trees, a walkway, picnic benches and a building housing restroom facilities. 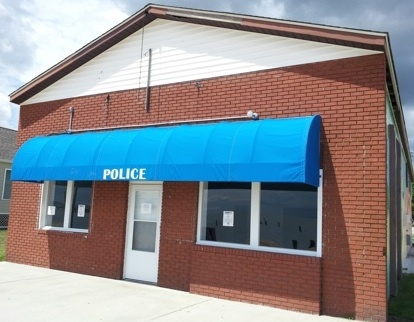 Sometimes referred to as the "Throne Zone" it was potentially going to be used for a teen gaming center called Socials and up until recently it was used as a police sub-station for special events. This building was dismantled in early 2016 and a new bathhouse was constructed nearby. The beautiful mural which was painted on the side of the building will be re-created elsewhere in town. The new bathhouse which was built on the site of the building pictured above. The new spray-off station, so you can rinse off after swimming and get the sand off your feet. 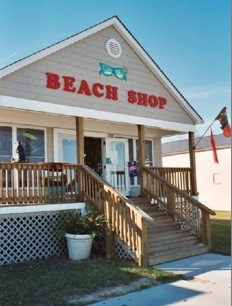 The Beach Shop is just ahead on the right and they sell all sorts of beach-related goodies and novelties. Next door is High Tides restaurant and their "Black Pearl Tiki Bar" area complete with a stage, firepit, sand, chairs and tables and of course, the bar. Continuing our stroll down the Boardwalk, on your right you'll see a couple of buildings housing food vendors. The waste receptacles that used to line the sidewalk had painted art panels affixed. This was done in early 2013 and really added some color and fun to the area. Those panels can now be found mounted to the side of the snack bar building. This picnic area is a great place to grab a corn dog, a beverage, some fries and beginning in 2018 - tacos! Next up is the LOVE golf cart, the brainchild of yours truly! 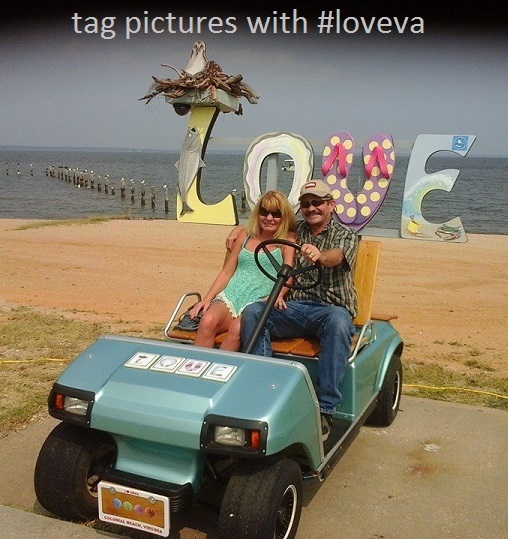 Many other towns in Virginia have a LOVE sign, why not Colonial Beach? I presented the idea and the cart is now a great addition to the Boardwalk. Note that it is unavailable during the winter months, when it goes into storage. On your left, you'll notice a gazebo and pier for the Potomac River Charters. 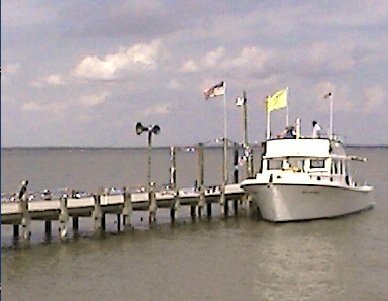 They offer boat rides and charter fishing on The Big Dipper. 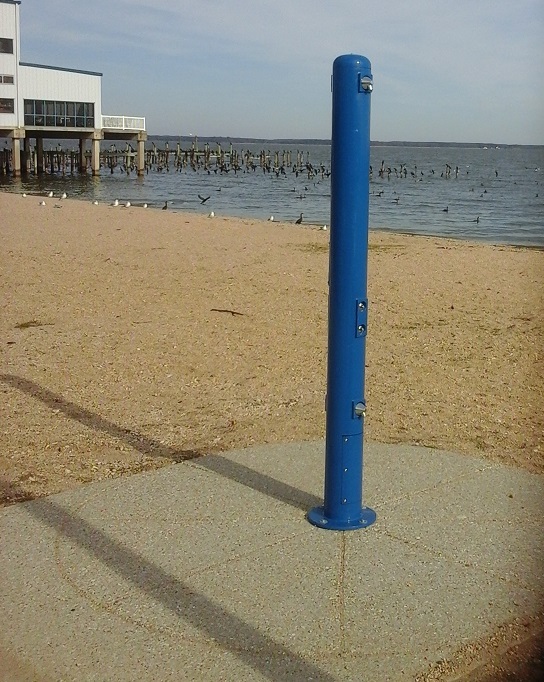 Just past their pier is the Town of Colonial Beach Municipal Pier. 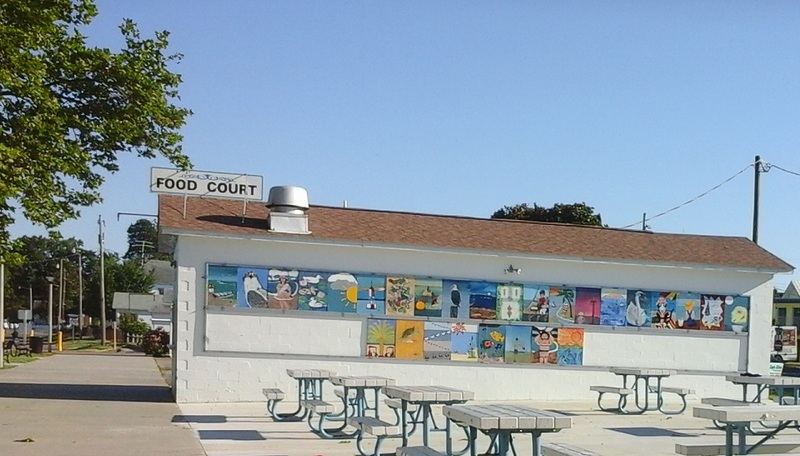 Across from the pier is a Visitor's Information Center building. Directly in front of the pier is the Pedestrian Plaza area which is being constructed as part of the Revitalization Plan. Historic Doc's Motel is on the right, as is "the Cannon" where memorial services honoring those who served our country are held every Memorial Day and Veteran's Day. This is where it winds down. To your left and in front of you is more of our fabulous beach area with metered parking and a beautifully manicured RiverWalk path that meanders along the beachfront. 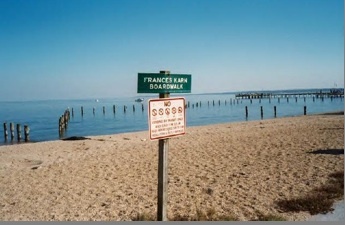 Colonial Beach has the second-longest public beach in all of Virginia, second only to Virginia Beach! 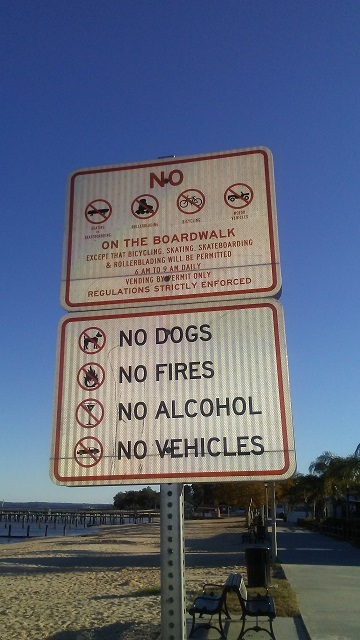 Between the hours of 6 - 9am daily, skateboards, skates, bicycles and rollerblades are permitted on the area extending from Lincoln Ave. to Hawthorn St.
Leashed dogs are only allowed on the Boardwalk from October 1 through March 31, unless they are a service/guide dog accompanying a disabled person.